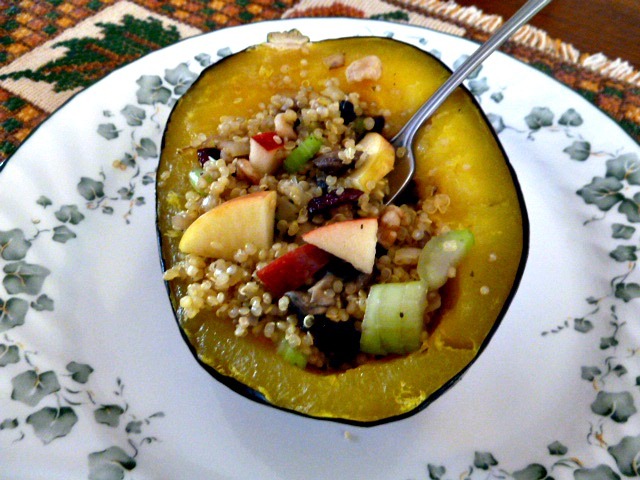 Baking and Cooking, A Tale of Two Loves: Acorn Squash Stuffed with Quinoa Pilaf with Mushrooms, and More. Acorn Squash Stuffed with Quinoa Pilaf with Mushrooms, and More. It's Fall, Yaay!!! We have had the cool Fall temps last week, and over the weekend. After all of our oppressive heat over the Summer, the cool air was welcomed. I love the crunch of the leaves underfoot. It isn't officially Fall until I buy candy corn, which I finally did this weekend, but I was disappointed in the candy. The one that I bought, was hard and tasteless. I'll be on the hunt for some better tasting candy corn. 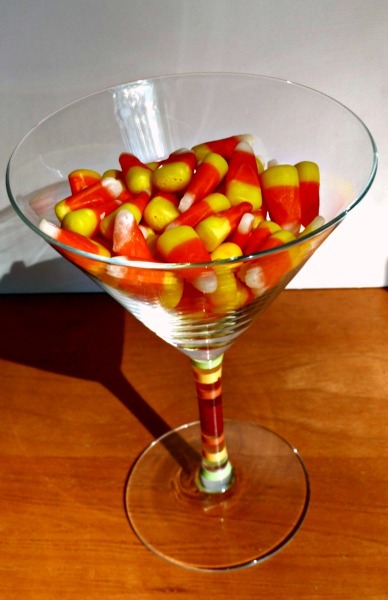 Do you have a favorite candy corn? Let me know! Besides Candy Corn in Fall, I love anything with pumpkin, apples, apple cider, and Fall squashes, and cinnamon, just to name a few. 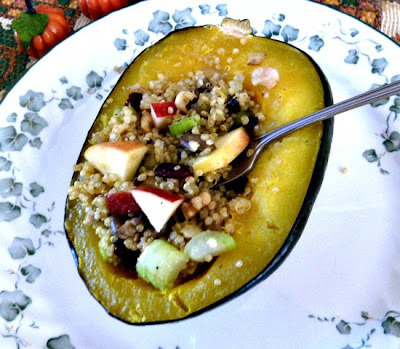 I saw this recipe with Acorn Squash stuffed with Quinoa Pilaf last week @ Jeanette's Healthy Living, and I knew that I would be making it soon. We love acorn squash and have them often during the Fall months. My Mom always baked them, when she made meatloaf, so to me they are comfort food, too. When I make acorn squash now, I usually cook the squash in the microwave, upside down in the dish with a little water and then turn them over, and fill the cavities, if I'm in a hurry. However, last week my microwave, a Magic Chef of 10 months, died!!! Now, I have to cook my oatmeal on the stove, and I baked the acorn squash in the oven. The previous microwave was a Sharp, and only made it 1/1/2 years, just past the warranty. The only good thing about the Magic Chef is that it was still under warranty, and Magic Chef is sending a refund check. Now, I have to buy my third microwave in 2/12 yrs!!! Does anybody have a reliable on the counter microwave that they like? Please let me know. I am beginning to think that "reliable microwave", is an oxymoron. It's not easy to live without the microwave:(. What a bummer week! My microwave died, and got bad candy corn. This has to be a better week. 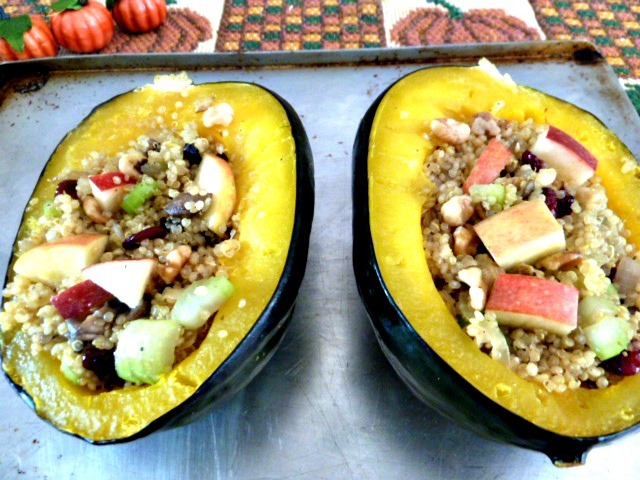 However you make this dish, which can be a side dish, if you use small acorn squashes, a main dish, if you are vegetarian, or add a little chicken to the quinoa, you will love this dish, We had them for lunch yesterday, and my hubby loved them, even the apples, walnuts, and dried cranberries, in addition to the quinoa, mushrooms, onions,celery, and herbs. This dish was also very filling, but healthy at the same time, and sure beats eating a another sandwich for lunch. This is a versatile recipe because you can vary the stuffing, depending what is in your pantry. I didn't have any pumpkin seeds, so I used toasted walnuts, and I added the chopped apples, which added a tasty touch and color. This dish would be perfect for a vegan or vegetarian dish for Thanksgiving. You could serve it at a dinner party or your lunch today! Even if you aren't vegan or vegetarian, this dish appeals to all. Brush tops and inside of squash cavity lightly with olive oil. Season lightly with salt, if desired. Roast in oven until fork tender, about 45 minutes to an hour. Roasting time will depend on the size of your squash. While acorn squash is roasting, heat 1 tablespoon olive oil in a large frying pan. Add half the onion and cook until softened, about 2-3 minutes. Add the quinoa, broth, water and thyme, and bring to a boil. Reduce heat to low, and cook, covered, until liquid has been absorbed, about 15-20 minutes. In a skillet, heat remaining tablespoon of oil, and add rest of onion, mushrooms, celery and sage. Sauté until vegetables are soft. Stuff acorn squash halves with Quinoa Pilaf, and serve. Enjoy! Becky, this looks so so good! And now I know what to do with that quinoa that is in my pantry. I have a huge bag full of quinoa in my pantry, so I made the quinoa pilaf. It's so good with all the veggies and protein. I also love roasted squash and I fill mine with both veggie and non veggie fillings. Yum!